MSF nurse at the neonatal care unit in MSF project in Irbid observes a new born Syrian baby‘’Abdullah. He spent weeks in the neonatal care to receive necessary care and follow up. Ahlam* is a 22-year-old mother from Dara’a governorate in Syria. She is the mother of two children, both of whom were born at the Doctors Without Borders/Médecins Sans Frontières (MSF) hospital for mother and child care in Irbid, Jordan. Here, Ahlam tells her story and recounts some of the challenges she has faced since she crossed the border to Jordan in 2012. At the beginning of the revolution in Syria, none of my family members even thought about leaving the country for a safer place, but the escalation in the situation there pushed us to cross the border to Jordan in May 2012. I can still remember the smell of fire in our neighborhood after the last airstrike, which happened just the night we left. We had a basement in my father’s house where all of my brothers, sisters, and children used to hide. It was impossible to continue living in a basement and [we were] too scared to even go to the kitchen or the toilet! We lived like this for months, then my uncle decided that it was time to cross the border to Jordan for the safety of the children and women. My husband refused to leave at the beginning and said he had to stay to protect our home and other property. So I crossed to Jordan with my mother, two cousins, and some neighbors, leaving my husband behind and having no idea what awaited us across the border. "We Simply Wanted to Live a Normal Life"
It took us 12 long hours to get to the first reception point for Syrian refugees inside Jordan. Then we were moved to Zaatari refugee camp. A few months later, we managed to smuggle ourselves out of the refugee camp. We simply wanted to live a normal life. This happened on the same day that my husband joined us and crossed the border to Jordan. We rented a very small apartment in Ajloun governorate in the north of Jordan. My husband tries to find work as a daily worker, earning what little he can so that we can afford to pay the rent. In December 2013, I had my first baby, born at the MSF hospital in the city of Irbid which is about 35 kilometers [about 22 miles] from where I lived. Despite this long distance, the MSF hospital was the closest place where we could be received without a refugee registration card. My neighbor in Ajloun who was also a Syrian refugee told me that MSF is providing free health care for pregnant Syrian women, and so we headed all the way to Irbid with my husband the following day. I visited MSF for several consultations a few weeks before my expected delivery date. I had a baby girl in early 2014. My second pregnancy was not as easy as the first one. I had complications which led to delivering a premature baby. On the evening of January 17, 2015, it was the last day in my sixth month of pregnancy. I had severe abdominal pain and bleeding. I knew that the MSF hospital in Irbid was the only place which would take us, so my husband took the decision to drive us for one hour and a half from Ajloun and Irbid. It was very cold and snowy that evening and the heavy traffic caused extra delays. I bled for one and a half hours on the way to the MSF hospital, but I knew it was my only hope! 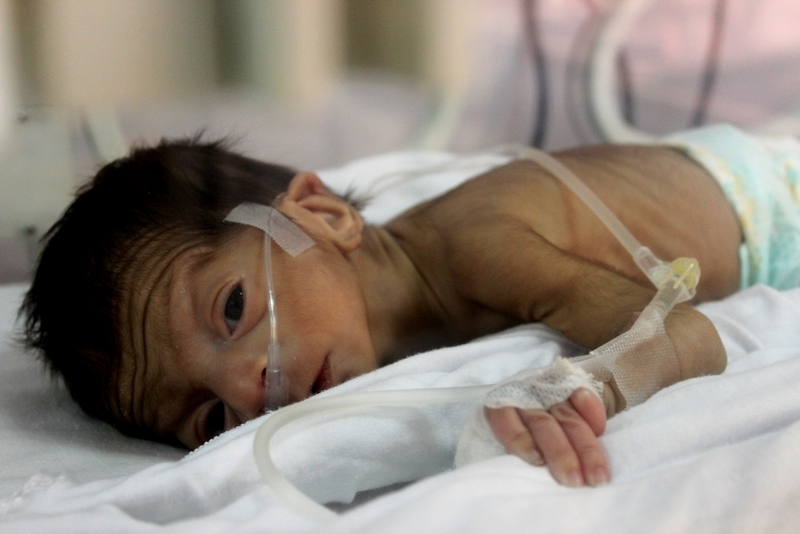 Baby Abdullah’s birth weight was approximately 5.3 pounds. We arrived at the MSF hospital where doctors decided I needed a C-section to deliver the baby. I was admitted immediately to the operating room and my baby, whom we named Abdullah, was born with a weight of only 2.4 kilograms (approximately 5.3 pounds). *The mother’s name has been changed. She gave full consent to use the real name of the baby and his photo.